Claim settlement ratio (CSR) is one of the vital statistics of an insurance company, which can give you a fair idea on how much you can trust it. The prime duty of an insurance company is to settle the claims and give the insured amount to the policyholder, on the occurrence of an unfortunate event. Insurance Regulatory and Development Authority (IRDA) in its annual report for 2015-16, throws light on the claim settlement practices of Life insurance companies of India. What is Claim settlement Ratio (CSR) and how it is important to you? Settling the claims in a fast and prompt manner is the prime duty and obligation of any insurance company. Claim settlement ratio is the percentage ratio between the claims settled and the claims received in the period of time. For example, if a company receives 100 claims out of which 90 claims are settled then the claim settlement ratio of the company is 90 %. Claim settlement ratio can be calculated on the number of policies or on the amount of claim settled. The ratio of the claims settled will give you a clear idea on the satisfied customers of the company. Further to add, the trust of the policyholders in an insurance company is directly related to CSR. The insurance industry in India 2015-16 highlights. In the year 2015-16 the share of Life Insurance business in India was 79% whereas that of Non-Life Insurance business was 21%. In Life Insurance business India is ranked 10th among 88 countries. The top five companies in claim settlement ratio are given below. Life insurance corporation of India (LIC) tops the chart with 98.33% which makes it the most trustworthy insurance company in terms of claim settlement. View an interactive chart to understand the change in the claim settlement ratio of top life insurance companies. Hover the mouse over the chart to get more details. We can see that there is an increase in CSR in almost all the companies except Bajaj Alliance. LIC the leader of the group registered an increase from 98.19% to 98.33%. Aegon Religare showed an increase from 89.78% to 95.31%. Reliance Life showed an increase from 83.84% to 93.82%. The chart given here will give you an idea on the CSR in terms of claim amount settled by top 10 companies. Let us have a closer look at the change in claim settlement ratio of private insurers alone. This ratio can give you an idea of how the insurance company treats high sum assured claims. This information is also very much important if you are considering to buy a term assurance policy. 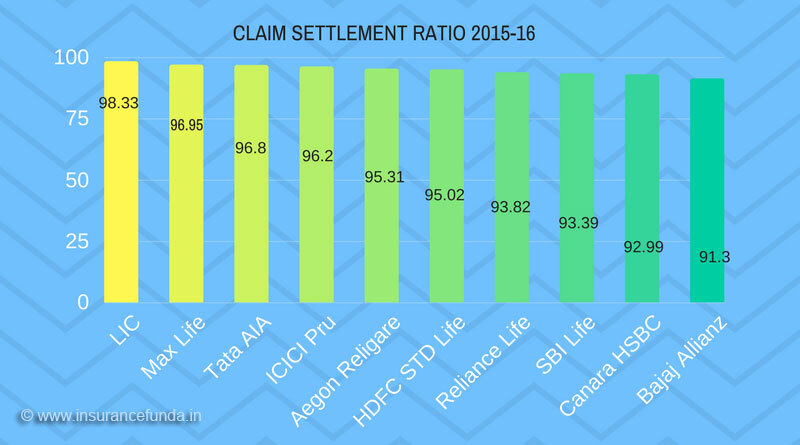 We can note an interesting fact that HDFC Standard Life which has settled 95.02% of its claims in terms of the number of policies, has settled only 69.41% in terms of the amount of claim settled. This leads to the fact that settlement of high sum assured or term assurance policies are facing difficulty with HDFC Standard life. Claim settlement ratio will give you a good idea on how likely a claim will be settled, on the occurrence of an unfortunate event. You are diving from an airplane, trusting your Parachute and in case it fails to deploy? Same is the situation with your life insurance policy when the claim is rejected. We have seen that the claim settlement ratio of many companies is below par. No need to add that, lion’s share of claim rejections result from certain loopholes provided by the policyholder at the time of purchasing the policy. Let us have a look at some important points to ponder at the time of getting insured. It is always wiser to avoid companies with poor claim settlement history. Fill the proposal form completely by your self. Get a copy of the proposal form submitted by you. Disclose all material facts in the proposal form. Mention all your previous policies while taking a new policy. Thanks for posting a brilliant information. I really too happy to read it. So much necessary information i’ll get from these topic.Thanks once again……………..